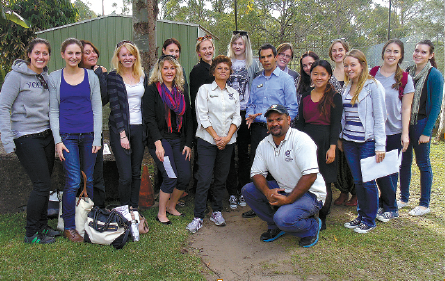 Educational visit: Ngutana-Lui cultural tutors Lisa Powell, Marlon Riley (centre) and Robert Duncan (kneeling) with Carolyn Chisholm Masters of Psychology students. A GROUP of psychology students experienced an insightful, moving and exciting day of indigenous tradition and culture during a visit to Brisbane Catholic Education’s Ngutana-Lui Cultural Studies Centre. The students are part of the Masters of Psychology (Educational and Developmental) Program at the Carolyn Chisholm Centre, a unique partnership between BCE and Queensland University of Technology. They spent the day learning about how indigenous Australians interacted with each other, used art and dance to communicate and educate, hunted for food and survived off the land. Student Emily Coote said the group experienced an array of activities from dancing, bush walking and learning about the different natural produce found surrounding the centre to traditional painting and storytelling. Emily said the meaning, power and symbolism found through storytelling resonated with her in a way that was hard to describe. ‘I found this was somewhat of a ‘light bulb’ moment in which I began to understand the importance of stories and how influential they can be in many different settings,” she said. “This visit, for me personally, was such a wonderful and moving experience and I left with very positive ideas and professional strategies that I feel I can use throughout the Caroline Chisholm Centre, not only with those clients of indigenous backgrounds but all clients. Emily said she left the centre with positive ideas and professional strategies that she felt she could use throughout the Caroline Chisholm Centre, not only with clients of indigenous backgrounds, but all clients. For student Rebecca Smyth the experience was something she would cherish and continue to reflect on. “Our warm, wise (and funny!) tutors, Lisa, Marlon, Robert and Brian; invited us to share in rich traditions including men’s and women’s dancing, face painting, dreamtime storytelling, and dot-paint artwork.